The MBH versions illustrated also splice reconstruction and instrumental values. 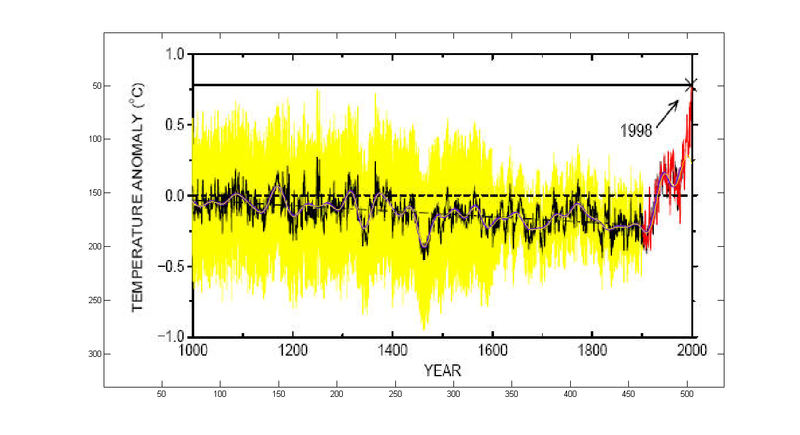 Thus, Crowley made two different splices of the temperature record into the proxy record. One splice is made in 1965, with proxy values for the 13-site composite (see below) before 1965 and instrumental values from 1965 to 1998 (with the 11-point smooth version ending in 1993). A second version is spliced in 1870, with proxy values from the 13-site composite before 1870 and instrumental records after wards. MBH98 has 50-year smoothing with padding of 1981-1995 instrumental. Additionally, the smoothing is cut back 25 samples (half of the “filter length”) from both ends. MBH99 used 40-year filtering with 1981-1997 (not 1998!) instrumental padding. The smooth is cut back 20 samples from the end but not from the beginning. This entry was written by uc00, posted on Feb 26, 2010 at 2:21 PM, filed under Uncategorized and tagged MBH98, mbh99, nature_trick, smooth, smoothing, uc, uc00. Bookmark the permalink. Follow any comments here with the RSS feed for this post. Both comments and trackbacks are currently closed. ..we supplemented our plot of reconstructed temperatures in MBH98 by additionally showing the instrumental temperatures, which extended through the 1990s. 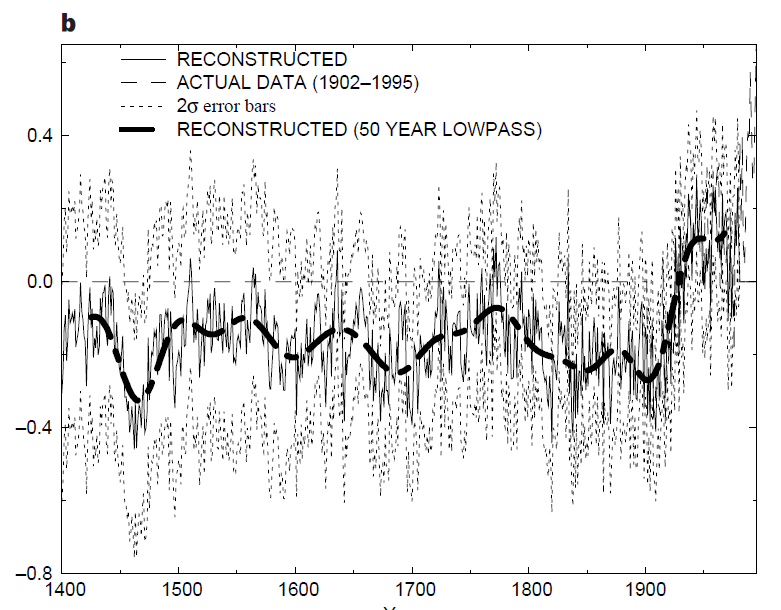 That allowed our reconstruction of past temperatures to be viewed in the context of the most recent warming. 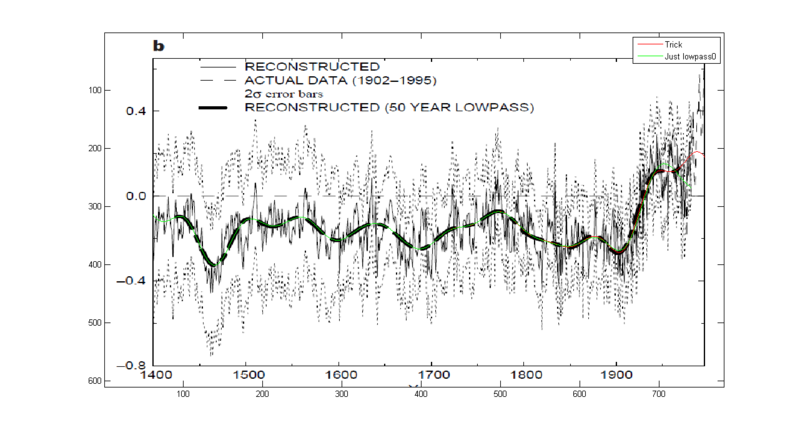 The separate curves for the proxy reconstruction and instrumental temperature data were clearly labeled, and the data for both curves were available in the public domain at the time of publication for anyone who wanted to download them. That, in short, was the “trick” that Jones had chosen to use to bring the proxy temperature series in his comparison up to the present, even though the proxy data themselves ended several decades earlier. There was one thing Jones did in his WMO graph, however, that went beyond what we had done in our Nature article: He had seamlessly merged proxy and instrumental data into a single curve, without explaining which was which. That was potentially misleading, though not intentionally so; he was only seeking to simplify the picture for the largely nontechnical audience of the WMO report. Added link to Steve’s 2005 post. But RECONSTRUCTED (50 YEAR LOWPASS) seamlessly merges proxy and instrumental? Or not? 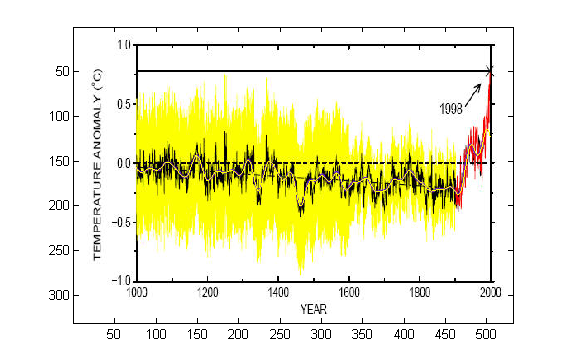 The story does not end here, Jean S has something new, http://rankexploits.com/musings/2014/the-meaning-of-r2-in-pictures-mann-v-steynsimbergceinro/#comment-123713 , https://climateaudit.org/2010/04/01/code-the-trick/ will be updated soon..
First link leads to an error message, UC. actually, after re-checking, it’s a zblock message, which I don’t really understand, but it might be a problem only on my end.